Have you heard or read a statement from some source recently that included that phrase? It is usually accompanied by some negative remark or story about the youth of today. Next time you hear that phrase, don’t let your self be drawn into the negative stereotype. Instead, think of all the good “ the kids these days” are doing. 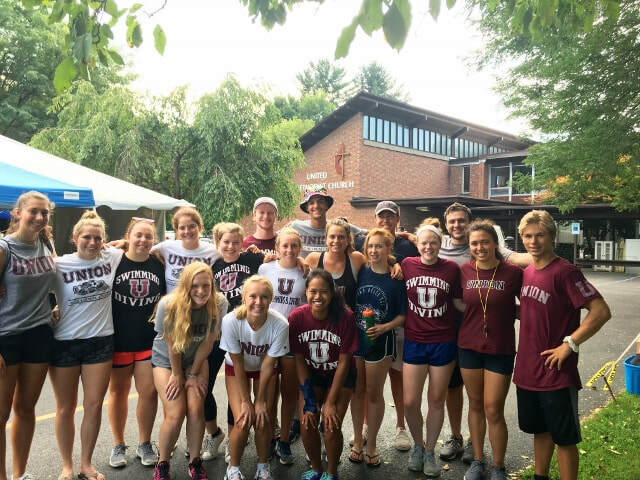 One such group of good kids is the Union College Swim team. For seven years, under the direction of coach Scott Felix, the kids have been “life savers” for the members of the Burnt Hills United Methodist Church. The church hosts the annual Lord’s Acre Fair during the first week of September and the amount of physical labor required to put on this fair is daunting to an aging church population. The Union Swim Team performs a type of “CPR” by lending their youthful strength and endurance during marathon sessions of setting up the for the fair and serving 400 chicken dinners. Their willing gift of service to our church community is immeasurable. So, those of us who come in contact with this great group of kids use the phrase “ Kids these days” in describing, with great confidence, the leaders of tomorrow. © 2018 Burnt Hills United Methodist Church.